This is the version of hat insignia that you seldom encounter in non-excavated condition. This is the version that is illustrated on page 119 of the headgear insignia book by O'Donnell and Campbell. 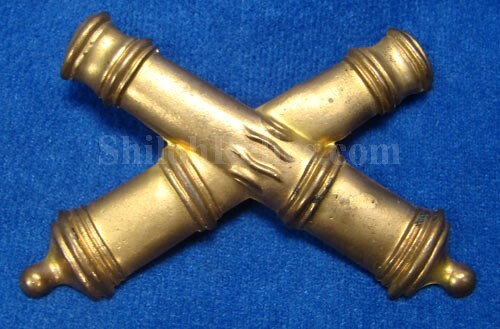 They are officially known as the 1834 pattern of artillery hat insignia and they list them as being in service from 1834 until approximately 1851. 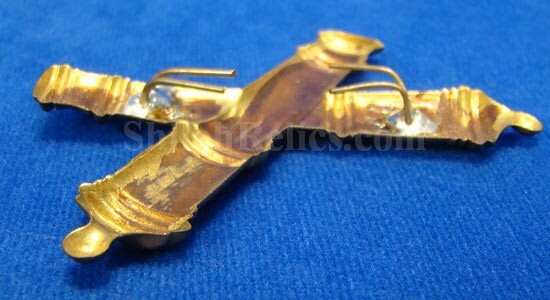 They measure 3 1/2 inches wide and are constructed out of stamped brass. The barrels themselves are quite a bit shorter and thicker in design than their later Civil War counterparts. This is the style that would've been worn on many of the artillery pieces of headgear worn during the Mexican war. The piece has a beautiful bronze color to the brass that displays exceptionally. On the reverse it has had a 4 prong attachments soldered onto the metal for attachment to the hat. 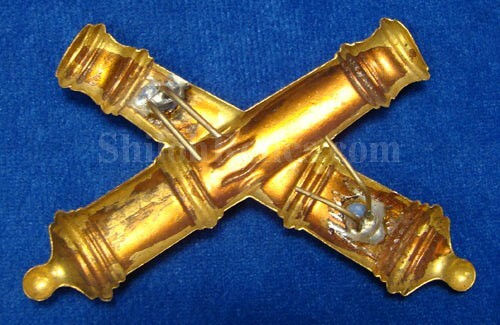 This is a beautifully displaying cross cannon hatpin from the 1830s or 1840s.